Merge and synchronize Calendar folders within your Microsoft Outlook. View and manage all of your appointments and events in one calendar. Workgroup Calendar is a personal tool and a downloadable PC software that allows you to create, synchronize and manage a group calendar with content merged from the chosen Microsoft Outlook Calendar folders including Public Exchange Calendars. If you are looking for a quick and easy way to smartly merge to one central (common) calendar and manage the contents of different Calendar folders from one place, this program is for you. 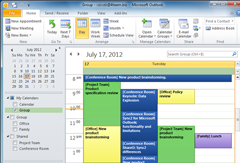 Create and view all of your Outlook appointments and events in one calendar. All of your appointments, calendar events, and meetings from selected calendar folders will be conveniently displayed in one place. With Workgroup Calendar you can make your scheduling a breeze, without switching between multiple calendars. Important note: With Workgroup Calendar you are not able to synchronize Calendars between different PCs. If you are looking for calendar synchronization tools, look at the Sync2 or ShareO software or purchase it together with Workgroup Calendar and get a discount up to 50%. Create and view all of your Microsoft Outlook appointments and events in one calendar. (Similar to Microsoft Outlook 2007 view in Overlay Mode with advanced functionality"). All of your Outlook appointments, calendar events, and meetings from selected calendar folders will be conveniently displayed in one place. Merge and synchronize as many Microsoft Outlook Calendar folders with Outlook as you want; including Public Microsoft Exchange calendar folders. Merge Outlook calendar folders that are being shared or synchronized using the software products developed by 4Team Corp (Sync2 or ShareO, ShareCalendar) or other developers. The subject structure of a merged event. The subject structure of a merged event: "[@ folder name or assigned name] Event Subject" will allow you to easily distinguish it from other merged folders events. I.e. : "[Joan Smith] Keynote: Workgroup Software presentation". Support for different Microsoft Outlook versions (2000, 2002, 2003, 2007, 2010). Support for Microsoft Exchange folders. Now you can combine Personal and Public calendars into one group calendar folder. You can also create group calendar folder in Public Folders. The default personal Calendar folder can be used as a group folder. Your product is the best one I could find for managing events and appointments of different Calendars - I would not hesitate to recommend Workgroup Calendar to my friends and collegues."